Although Jeff Collins only joined Superior of Indiana just over a year ago, he has achieved so much in this relatively short time. 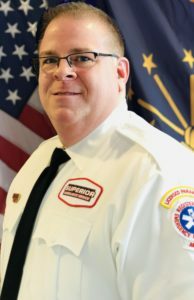 Jeff brought 29 years of EMS experience and knowledge with him to Superior, and that, along with his enthusiasm and commitment, has added greatly to our service. His wide-ranging experience has stood him in good stead over the past year, and Jeff has developed the Indiana Division by leaps and bounds. He has overseen the implementation of primary 911 service for five cities, including 10 ALS Ambulances and an Emergency Response Vehicle. On top of that, the number of EMTs and Paramedics has increased by 100 percent and the call volume by 80 percent. Jeff has introduced great employee retention projects to keep our trained staff with Superior and implemented a critical incident stress management (CISM) program. He also launched a Service Excellence Award. Jeff always takes the time to go out and meet with his employees and to listen to them and their concerns and suggestions. We are grateful for Jeff’s dedication, leadership, expertise, and never-ending vision of where we can go to next.